In the anticipation of the publication of the dinosaur paper I thought it may be timely to highlight one of my latest papers. [Please note that this blog is also cross-posted on ecomorph.wordpress.com, my personal webpage]. This paper was one of the first steps towards inferring activity pattern in extinct dinosaurs and pterosaurs. 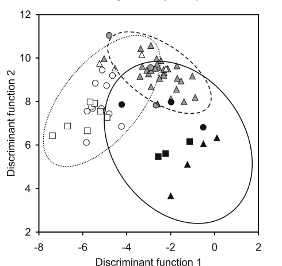 We needed to find out whether it is possible to distinguish night-active and day-active living species before we could make any quantitative inferences in fossils. It was known previously that activity patterns indeed influence eye shape (see, for example, papers by Margaret Hall, Chris Kirk, and Callum Ross), but a reliable method to make quantitative predictions was still lacking. Here is the short version of our approach: The eyes of land vertebrates cope with highly different light levels, largely depending on the preferred activity time of the animal. Night-active (nocturnal) species experience much lower light levels than day-active (diurnal) species. Twilight-active (crepuscular) and day-and-night-active species (cathemeral) species are exposed to both high and low light levels. The problem with low light levels is that it is very difficult to form a good image. Overall, then, these contrasting lifestyles (and light levels) should drive the evolution of eye shape, because nocturnals need to have eyes with very good light sensitivity, whereas cathemerals and especially diurnals can optimize other aspects of vision. We tackled this problem by applying Discriminant Analysis, focusing on features of macro-morphology that are correlated with optical function. Indeed, different activity patterns occupy distinct areas in morphospace and are identified with high accuracies (see the image to the left, modified from the Vision Res. paper). Diurnals are represented by open symbols, gray symbols are cathemerals, and black symbols are nocturnals. The great news for paleobiology was that this method not only works with eye soft-tissue dimensions like eye diameter, axial length, or lens diameter (which rarely if ever fossilize), but also with skeletal features (i.e., size of the orbit and scleral ring) of birds. These skeletal structures are still correlated with optical function, even though their shape is influenced by other factors as well (see, for example, Schmitz 2009, J. Morph.). So, potentially one may be able to retrieve some or most of the optical information recorded in scleral ring and orbit structure… more on this next week!